The Trailer that Ruins the Movie - Part One. Well, what about them? Those trailers, sometimes you love'em because you are showed just enough to get really in the mood for something special or you hate them because they have showed you too much. But you can only know if you have been shown too much of the movie if you actually go and watch the whole thing. Off course i have seen loads of trailers, and in the days when i was growing up, ( that is in the beautiful 80's) you got a couple of those on a weekly basis on tv. Or if you were a regular movie-goer you could watch them in the cinema, usually before the main attraction, like it is still the case nowadays. However times have surely changed trailer-wise. Now you can have them really all the time, when you go online you stumble upon them if you open certain sites. They do not need to be movie sites, it can be a complete unrelated site you are visiting and look at that in the corner. A link to a trailer of……. . And on TV the appearance of trailers have increased. Then we have the number of trailers for one movie. Yes, my dear, the commercial people and certainly not the artistic people (at least i think they would not would recommend this) think it would be a great idea to make not one, but 2, 3 or maybe 4 trailers for a (usually big budgeted movie). The common idea behind this is that if you show them a little more each time, curiosity will increase. The victimized viewer cannot wait to watch this celluloid wonder because each and every extra enticing second that is bestowed upon him or her, will further convince him or her to visit the cinema of choice to pay a ticket and go see it. But when you are going to show more than only the 1 trailer and you are witness to more scenes is that good or bad? It is not uncommon that much of the plot or certain crucial developments which are a vital part of the story are shown in the preview. This can only diminish the overall impression one gets while watching the whole feature. When surprises do not longer surprise or are not seen as such, people will be less appreciative of that what they are witnessing. Still even worse, it must be killing for the makers of the movie that certain elements which should function as a twist, a surprise or a great action scene are already familiar with the targeted audience. I imagine these situations can be very demoralizing for a writer, producer, director and other participants of a picture. This only gets more problematic when there are more trailers for one movie, when still more is revealed. OK, there is of course the choice of the audience to not seek out every trailer out there for the movie, or just watch the trailer once and not five or 6 times. But as I have stated earlier, you can stumble upon it unwittingly and temptation is always there. Curiosity is a difficult trait to control. To my own stupidity I had a similar experience in the 80’s when Paul Verhoeven’s Total Recall was ready to storm the box office. This was in the time that trailers were shown on tv and on MTV. I watched a lot of review shows then, one of them was MTV at the Movies, and during those days I must have seen that trailer a dozen times. I was so psyched to see this one, that the trailer was necessary for me to watch over and over for some sort of temporary gratification until the damned thing would finally would hit the theatre. And there were off course certain great scenes in the preview. Two things come to mind. The fat woman disguise where Arnold Schwarzenegger is emerging from and then her head explodes, and the fact that Sharon Stone is a baddie(or badass) or wasn’t that really a a spoiler? What happened for me is that the scenes that I saw in the trailer became a sort of movie in itself. And when I saw it in the cinema, every time I saw one of these familiar moments it took me right out of the picture instead of drawing me nearer in. So even if I thought this was a very good movie, with some outstanding special effects. It could never surprise me and entertain me as intended by the makers. As this is going to be a larger piece then intended I am going to split this one in two. Therefore I willI be back with my conclusive thoughts about this matter. 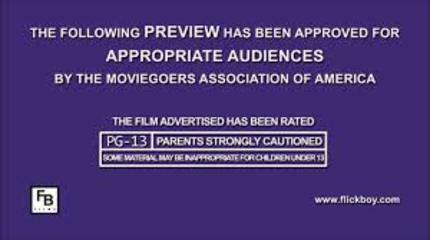 I completely agree that the current situation with movie trailers is one that ultimately does the consumer no favors. The market is saturated and they show WAY too much. Over the past couple of years I have gotten in the habit of only watching the first trailer for anything that I am interested in and hoping that it doesn't show me too much. Anything else that comes out after that I avoid like the plague, often having to go as far as avoiding articles and sometimes even entire websites for fear of finding out something that I don't want to know until I am supposed too. Why does everyone try to cram spoilers down the throats of others? That question goes to both the marketers of the product as well as to the consumers who can't wait to be the one to 'show it to you first' like they are validating that that they are somehow special because of the advanced knowledge they have gained. Come on Hollywood, Less is more. Take a lesson from AMC and The Walking Dead. They are great at teasing just a little and giving next to nothing away because (I believe) they know the real enjoyment lies in the experience of watching the actual show, not the tease before it. It's not the trailers. It's the whole industry. The fact that there seems to be a rule that trailers have to be two and-a-half minutes losing has something to do with it. That's far too long. I often only watch about a minute of a trailer I'm looking forward to because I know that after that the movie is going to be spoiled. One of the most vocal culprits of this is Robert Zemeckis, who openly admits he likes to put his whole movie in the trailers claiming that people want to know exactly what they're going to see. Disgraceful. Great read. It's all about building expectations now instead of building suspense. This has hit the horror movie industry especially hard, mainly because part of the joy of the genre is fear of the unknown. Don't Breathe had some great scares and surprises, but that trailer managed to take the wind out of a number of both. The idea that giving the audience a bigger taste of what to expect is going to attract more people, this doesn't hold true for a genre that will get an audience in the door no matter what. It at least makes slightly more sense when it comes to big, effects-laden affairs, The worst offender in recent memory was every single story beat and action sequence in the trailers for Amazing Spider-Man 2, which were unavoidable. The movie was a mess, but I'm fairly confident that more people would have enjoyed it if they didn't know what was right around the corner at every moment. Same situation with Suicide Squad, which was an equal mess that likely would have been more enjoyable if the whole thing wasn't in the trailers...and in that movie's case, the trailers actually altered the final cut of the movie that hit theaters. Their entire marketing campaign was about building expectations, which came crashing down once we saw it. If they had built the suspense, the anticipation of seeing the movie to FIND OUT what happens, it would have been a much different reception. But it comes down to numbers, and since Suicide Squad has made a fortune we can look forward to more of it. The only way the industry changes is if the audience doesn't pay attention anymore, and that isn't happening.